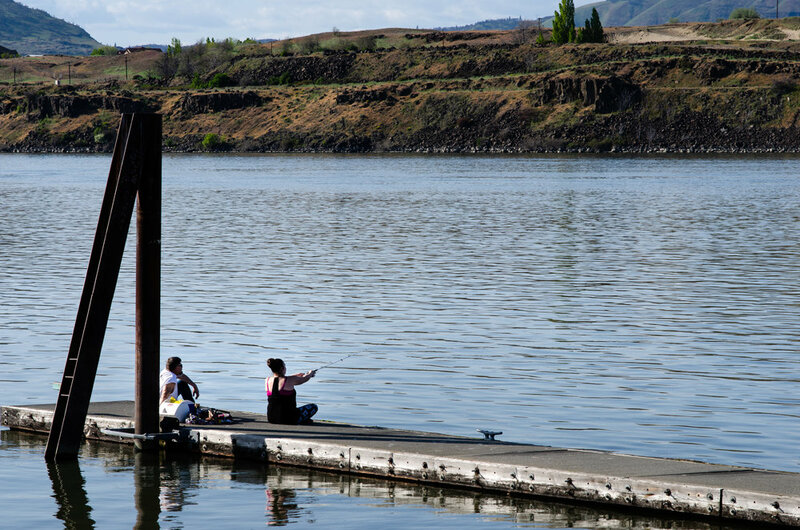 People fishing off the dock at Riverfront Park in The Dalles, Ore. Soil in the Columbia River near the dock is contaminated by pollution from a creosote plant located on shore. The river is home to salmon, steelhead and sturgeon. THE DALLES, ORE. -- As we head into the dog days of August, people will dip their toes into the cool waters of the Columbia River, which carry an invisible load of toxic chemicals. And people ingest some of those chemicals whenever they eat fish from the river. A 2009 study funded by the US Environmental Protection Agency (EPA) and conducted by Columbia River Intertribal Fish Commission (CRITFC), found 92 toxic chemicals in fish caught in the river, including dioxins, furans, PCBs, arsenic, mercury, and DDE, a toxic breakdown product of DDT. In 2002, the EPA discovered that Columbia River fish are contaminated with seven types of dioxin. 1922- Tie Treatment plant opens on Union Pacific land in The Dalles. Nebraska Bridge and Timber Supply is the first operator. 1937- US Army Corps of Engineers builds a pipeline for sending untreated industrial waste from the creosote plant directly into the Columbia River. 1948 – The plant is flooded when the Columbia River breaches the levee. 1950 - J.H. Baxter and Company becomes plant operator. It begins to use pentachlorophenol and ammoniacal copper arsenate in addition to coal tar creosote as wood preservatives. 1957 - A well is drilled as a source for drinking water, but is not used because of groundwater contamination. The well was sealed. 1963 - Interstate 84 is built along the northern perimeter of the site. 1967-1970 - Army Corps of Engineers receives various reports that oil has been released into the Columbia River north of the site in the vicinity of the outfall for the pipeline. 1971 - Army Corps removes pipeline that has been dumping untreated wastes from the plant into the river for 34 years. 1980 – Congress passes the Comprehensive Environmental Response, Compensation, and Liability Act, known also as Superfund. 1984 – Union Pacific donates Riverfront Park to the city of The Dalles. EPA issues a Preliminary Site Inspection Report for the site. DEQ begins to study contamination at the site. 1987 - Kerr-McGee purchases plant buildings, while Union Pacific retains ownership of the land. Use of pentachlorophenol is discontinued. 1990 - EPA adds the site to its National Priority List of Superfund sites. 1993 - DEQ releases 1,800-page Remedial Investigation Report. 1995 - Union Pacific builds a cap over contaminated sediments in the Columbia River. 1996 – DEQ issues “Record of Decision,” a document that guides cleanup of the site. 1997 – Union Pacific signs a consent decree under which it agrees to pay for the cleanup. 2005 – Kerr McGee sells the plant to AmeriTies West LLC. Union Pacific continues to own the land. All of these chemicals threaten human health, especially dioxin, the most carcinogenic pollutant emitted by industry. Although it’s impossible to trace all of this pollution to its original source, an archive of 5,500 pages of mostly technical documents released in May by the Oregon Department of Environmental Quality (DEQ) points to a heavily contaminated Union Pacific Superfund site located near the river in The Dalles as a likely source. This Cascadia Times article is based on our review of those documents. The documents show that during nearly a century of dousing railroad ties with creosote and other chemicals, the plant contaminated the 83-acre site with a vast amount of pollution, including dioxin, a pollutant that takes a long time to break down once in the environment. Instead, chemicals tend to bioaccumulate, or build up in organisms. Site owner Union Pacific began cleaning up the site in the mid-1990s after EPA named it a Superfund site (a federal designation for the worst contaminated sites). Such as it is there is still no time table for the clean up to be finished. In 1991, under DEQ’s supervision, contractor CH2M Hill found dioxin in two soil samples near the tie treatment plant some 500 feet from the river. The DEQ’s documents show that for 34 years, the plant pumped contaminated wastewater from the general area where the dioxin was found directly into the Columbia River, a practice that produced visible oil sheens on the surface of the water. The plant also pumped contamination into a park next to the river. Curiously, David Anderson, a DEQ cleanup manager, says the two soil samples tell us all we need to know about dioxin contamination at the site. After determining that the two samples contained only tiny amounts of the chemical, the DEQ decided it needed to look no further. It did not check for dioxin in the park, where it had already found several hot spots of toxic contamination. Nor did it look in the river, where the plant’s effluent contaminated more than an acre of sediments on the river bottom down to a depth of 4 feet. Chuck Hudson, spokesman for CRITFC, a Portland-based group that represents the Warm Springs, Umatilla, Yakama and Nez Perce tribes, says DEQ should renew its dioxin investigation at the site, even though three decades have passed since the search ended. “We strongly urge DEQ to conduct further investigation,” said Chuck Hudson. “Given the broad area, both on land and river bottom, known to be impacted by the decades of contamination a comprehensive investigation is needed,” he added. The public has reason to be concerned about the extent of dioxin contamination at the site. Widespread dioxin contamination has been found at similar railroad tie treatment sites in many other states. At least some of these sites have been contaminated with the most dangerous type of dioxin -- a substance known as 2,3,7,8-tetrachlorodibenzo­ p-dioxin (TCDD). TCDD, an impurity found in the Vietnam-era defoliant Agent Orange, is about 2500 times more carcinogenic than hexavalent chromium, the highly toxic compound made infamous by the movie Erin Brockovich, according to the EPA. TCDD is also known to contaminate pentachlorophenol, a chemical used for 37 years at the plant in The Dalles. Under a consent decree approved in 1997 by a Wasco County court, Union Pacific so far has pumped more than 120,000 gallons of creosote, a dark dense oily goo, from aquifers located several hundred feet under the ground. The aquifers drain their contents into the nearby Columbia, likely contaminating fish as well as unsuspecting windsurfers and other water enthusiasts. A map showing the approximate location of contamination from the AmeriTies creosote treatment plant in The Dalles - a Superfund site since 1990. By the time the cleanup work is completed, only about 30 percent of the total amount of contamination will have been removed, Anderson said. He said the remaining 70 percent will remain because it is immobile, caked onto rocks beneath the ground, or trapped within porous boulders. At that point, he said, it should pose no threat to anyone -- a view that is not universally accepted. “It’s unacceptable for the government to take decades to cleanup toxic sites, when people are using the Columbia River every day,” said Lauren Goldberg, a staff attorney for Columbia Riverkeeper, a citizens group that advocates for the protection of the river. By no means is The Dalles site the biggest polluter on the river. The nuclear-waste riddled Hanford Site, the most contaminated place in the western hemisphere, is located about 150 miles upstream. The Dalles site is one of 13 Superfund sites in Oregon and among 1,337 in the United States. A number of companies operated the tie treatment plant over the years, including Kerr-McGee (the company sued in the infamous Silkwood case) and the current operator, AmeriTies West. Today, the plant emits toxic air pollution which some residents of The Dalles say is making them sick, as Cascadia Times reported in May. Community members’ health complaints were dismissed by the federal Agency for Toxic Substances and Disease Registry (ATSDR) in a Health Consultation Letter released to the pubic last month. But an investigation by Cascadia Times found significant gaps in ATSDR’s analysis. This spring, while Cascadia Times reporters were looking into the plant’s air pollution, an anonymous tip triggered a focus on dioxin. Dioxin is a group of several hundred different chemicals featuring chlorine atoms attached to hydrocarbons, a basic design also common to such chemicals as mustard nerve gas, DDT, polychlorinated biphenyls (PCBs) and pentachlorophenol. At first blush, the documents released in May by DEQ did not appear to confirm the presence of dioxins at the site. For example, a 1996 document known as a “Record of Decision,” which lays out a cleanup plan that’s still in effect today, makes no mention of dioxin. Nor do a series of consent agreements requiring Union Pacific to pay for the cleanup. A DEQ fact sheet published in 2016 also says nothing about dioxin. But after digging deeper into the archive, it quickly became clear that dioxin had in fact been found. A few details about this discovery appear in a 1,800-page document entitled, “Final Remedial Investigation Report,” which was prepared for Union Pacific by the engineering firm CH2M Hill in 1993. In a multiyear investigation that started in 1989, CH2M Hill collected hundreds of samples from the site, according to this report. It found the site’s worst contamination under a pond where over the years the plant had dumped unknown quantities of wastewater and other toxic chemicals. In samples collected in 1990, CH2M Hill discovered the pond was heavily contaminated with several carcinogenic chemicals, including pentachlorophenol, naphthalene, and polycyclic aromatic hydrocarbons (PAHs). Pentachlorophenol, also known as penta, was the primary wood treatment chemical used at the plant for 37 years, beginning in 1950, shortly after the pesticide was initially brought to market and ending in 1987 when EPA restricted its use because of its potential to harm the health of people exposed to it. Commercial-grade penta is contaminated with dioxin, according to EPA. In 1991, CH2M Hill re-sampled the soil twice at depths of 3 and 11 feet under the pond. An analysis showed the samples tested positive for three types of dioxin, including hexachlorodibenzo-p-dioxin (HxCDD) and two others. The EPA says dioxin type HxCDD is 100 times more carcinogenic than hexavalent chromium, the highly dangerous pollutant found at many industrial sites around the United States. EPA ranks dioxin type TCDD the top of its list of the most dangerous carcinogenic pollutants in the environment. HxCDD ranks second. But DEQ made no further effort to collect dioxin from any other location on site. Anderson, the DEQ cleanup manager, said the amounts of dioxin detected in the soil were too small to pose a health threat to anyone. A discarded railroad tie found on the beach at Riverfront Park on the Columbia River in The Dalles. For many years, the plant pumped chemical wastes mixed with stormwater directly into the river via an underground pipe that extended 150 feet from the shore. Built in 1937 by US Army Corps of Engineers, the pipe and an associated pumphouse also dumped toxic chemicals into Riverfront Park next to the river. In 1994, Union Pacific removed 2,450 cubic yards of contaminated soil from the park, almost enough to fill the Moda Center sports arena in downtown Portland. In 1967, the Army Corps began hearing reports of oil sheens surfacing near the end of the pipe. Four years later, it plugged the pipe with concrete, but never analyzed the pipe or its contents for dioxin. In 1994, Union Pacific found that about 1.4 acres of Columbia River sediments as far as 300 feet from shore and down to a depth of 4 feet had been contaminated. Sediments contained elevated levels of penta, arsenic and several other carcinogenic compounds, including naphthalene, the main pollutant in the plant’s noxious air emissions. No one tested the sediments for dioxin. Union Pacific covered the contaminated river sediments with a cap consisting of a fabric lining, a layer of gravel, and riprap. Although the cap has eroded significantly over the years, often during major floods, DEQ says it still covers all of the contaminated sediment. Union Pacific has agreed to continue monitoring the cap far into the future. Meanwhile in 1994, a tribal study funded by EPA revealed that members of Indian tribes were consuming much more fish from the Columbia River than previously estimated. Accordingly, the study said tribal members were also found to be ingesting a much larger amount of toxic contamination. of water quality standards then in effect. The fish consumption study called into question the “applicability and adequacy” of water quality standards in effect in the 1990s. DEQ’s water quality standards are based in part on fish consumption rates -- and no group of people eats more fish than tribal members. The 1994 study showed the water quality standards were 10 to 50 times over the amount needed to protect the health of tribal members, according to an EPA scientist who spoke to Cascadia Times on the condition of anonymity because agency rules do not allow media contact without prior authorization. Based on results of the fish consumption study, tribal members -- especially members of the Umatilla tribe -- challenged the water quality standards, which are intended to protect the health of people who eat fish contaminated by toxic chemicals. In 2011, after reviewing fish consumption studies, DEQ tightened its water quality standards for toxic chemicals, based on a new estimate that tribal members consumed 26.9 times more fish than previously thought. DEQ said the old rules did not adequately protect the health of people who eat fish on a regular basis. The new rule covered more than 100 toxic pollutants, including dioxin. But as for the Superfund cleanup in The Dalles, DEQ continues to rely on the old standards in effect prior to 2011. This is one of several issues that could be sorted out in the investigation that tribal members are now demanding. The tribes have much more than a passing interest in water quality in the Columbia and the health of its fish. In the Stevens Treaty of 1855, they ceded land to the United States, but reserved the right to fish. CRITFC contends that the documented degradation of water quality in the Columbia River, coupled with the consistent decline of fish runs and the loss of adequate fish habitat, have heightened concern for the health and livelihood of tribal members. It’s not unusual for Superfund sites to be contaminated with penta as well as dioxin. ATSDR says wood treatment plants have contaminated about 250 communities around the country. One of these was a plant on the other side of the country in Columbus, Miss., which was owned by Kerr-McGee, the same company that operated the plant in The Dalles. Just before the Columbus plant closed in 2003, both penta and dioxin contaminated the site and the surrounding neighborhood, according to the EPA. Toxicologists found dioxin in the kitchens, attics and bloodstreams of nearby residents. They also found seven types of dioxin in the blood of people in residents, including dioxin type TCDD, the most dangerous type of dioxin and the type found in Agent Orange the Vietnam-era defoliant. the seven types of dioxin found in Columbia River fish. The seven types of dioxin found in the blood matched exactly the seven types of dioxin EPA found in Columbia River fish. As we’ve noted, the plant in The Dalles used pentachlorophenol, a chemical known to be laced with dioxin, for 37 years. The Columbus plant used pentachlorophenol for just 23 years. In 1999, Columbus residents sued Kerr-McGee for health damages. Their attorneys hired experts to test homes, properties and even bodies for the presence of dioxins and other toxic substances associated with wood treatment plants. Columbus residents suffered from skin itch, headache, eye burning, sore throat, nausea, cough, and chest tightness. So did people, including children, in The Dalles. Dr. James Dahlgren, a toxicologist at the UCLA School of Medicine, conducted a battery of tests on people who lived near the Columbus plant. He found dioxin in the bloodstreams of 10 people. Dr. Dahlgren also found dioxin in swipe samples from kitchens and attics. Dr. Dahlgren, who is now retired, published his findings in 2002 in a study published by a peer-reviewed journal. ATSDR cited the study in its own evaluation of health problems related to wood treatment plant pollution. In 2009, ATSDR noted that Dr. Dahlgren’s data showed that people exposed to wood treatment chemicals are five times more likely to develop cancer than people who were not exposed to those chemicals. in addition, they were three times more likely to suffer from bronchitis and four times more likely to have asthma. Tribal members along with others in The Dalles are hoping for a similarly aggressive investigation in their city that they hope will resolve questions about the creosote plant's decades of toxic effluent. While many residents continue to have questions about the health impacts of the plant's air and water pollution, Hudson simply wants to know whether the dioxin found in the fish came from the Union Pacific Superfund site and if there is more to be found. But as of now, DEQ is not planning to find out. Submit online comments to Cleaner Air Oregon industrial toxics rulemakers here. Demand Oregon Health Authority investigate health symptoms of people, especially children, in The Dalles. An investigation should include health screenings, interviews, blood tests, and a check for the G6PDD gene, and collection and testing of dust samples from homes in The Dalles. Demand a complete investigation of the contamination and cleanup of the Union Pacific Superfund site in The Dalles. Demand tougher restrictions on pollution from the creosote plant in The Dalles. Ask for the same limits imposed by the state of Arkansas on the number of railroad ties that can be kept in storage at a similar plant in that state. Support the efforts by the Columbia River Intertribal Fish Commission, Columbia Riverkeeper, Friends of the Gorge and The Dalles Air Coalition to preserve and protect the Columbia River. View DEQ’s archive of Union Pacific Superfund site documents here.